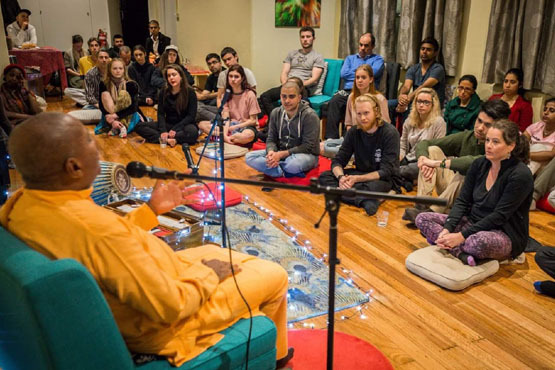 Urban Yoga teaches advanced spiritual knowledge from the Bhagavad-gita and Srimad-bhagavatam and practices a form of devotional yoga called Krishna bhakti. This wisdom derives from the sacred and timeless hymns of the Vedas. Urban Yoga is a branch of Gaudiya or Chaitanya Vaishnavism, a movement inaugurated by the celebrated teacher Chaitanya Mahaprabhu in the sixteenth century. Gaudiya Vaishnavism teaches advanced monotheism based on the theistic Vedanta of Ramanuja (12th c.), Madhva (13th c.), and Baladeva (18th c.), whose teachings are rooted in the Upanishads, the earliest philosophical texts of India.